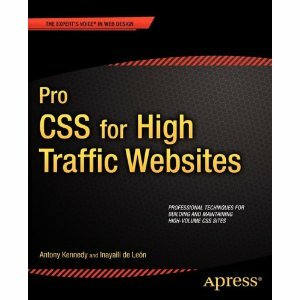 Apress has just released a book called “Pro CSS for High Traffic Websites”, written by by Antony Kennedy , Inayaili de Leon (ISBN-13: 978-1-4302-3288-9 – 400pp ). This book is for Web developers building and maintaining premium, successful, high-traffic websites using web standards. This book will also help team leaders responsible for code that will be shared over multiple projects, as well as project managers with a high churn of contract staff.